Noise-induced hearing loss is a condition which currently affects about 10 million Americans. It is the most common preventable cause of hearing loss which is due to damage of the ear’s sensory nerve. The prevalence of noise-induced hearing loss and the number of people affected have steadily grown right along with the development of society—as more and more of man’s creations create noise pollution which damage a person’s hearing. Probably most people understand the damage that can result from being close to a gunshot, but far fewer people are aware of potential damage from more mundane causes like leaf blowers, lawnmowers, traffic sounds, car alarms, music concerts, and even the stadium noise at a sporting event. The truth is, any loud noises which are received by the ears over an extended period of time, no matter where they came from, can cause significant damage to the inner ear. Eventually this can lead to dizziness, ringing in the ears, some degree of hearing loss, and even issues unrelated to hearing, such as high blood pressure and an irregular heartbeat. Noise-induced hearing loss is the condition which results from having an excess of sound energy reaching the inner ear. When the excess sound energy is temporary, any hearing loss is also likely to be temporary and reversible. A good example of this would be attending a loud rock concert where sound undergoes a great deal of amplification, and excess sound energy reaches every person in attendance, regardless of where they’re sitting. It is fairly typical for someone attending a concert like this to completely recover within the next day or two, because the excess sound energy has dissipated. If that noise were to persist over a longer period of time, however, it is quite likely that the damage to the inner ear would be irreversible, and the listener would be subjected to a permanent loss of hearing. It is also possible for excess sound energy to be so profound as to rupture a person’s eardrums, rendering them more or less deaf. Still more problems can be created if a person’s eardrums are shattered and he or she also develops severe dizziness, which is usually an sign that there is a perilymphatic fistula, i.e. an inner ear hole, created between the middle ear space and the inner ear fluid. Surgery in such cases may eliminate the dizziness, but the hearing loss is likely to remain permanent. Ear plugs can aid against noise-induced hearing loss. Two of the best kinds of protection for the inner ear are the simple devices we know as earplugs and earmuffs. Earplugs are small-sized devices made of various materials, which can easily fit into the outer ear canal to block sound reception. Since they come in many different shapes and sizes, earplugs can be fitted to virtually anyone’s ears, and the fit is very important because there must be an airtight seal in the ear canal to block excess sound energy from reaching the inner ear. Earmuffs on the other hand, are devices fitted to the head, and they cover the entire outer ear to prevent sound energy from reaching the ear canal. These devices usually have an adjustable band which allows for a tight fit, and as in the case of earplugs, a tight fit is very important so as to make a good seal against excess sound energy. The choice of which of these devices to use for any given situation is contingent upon which kinds of sounds need to be blocked. 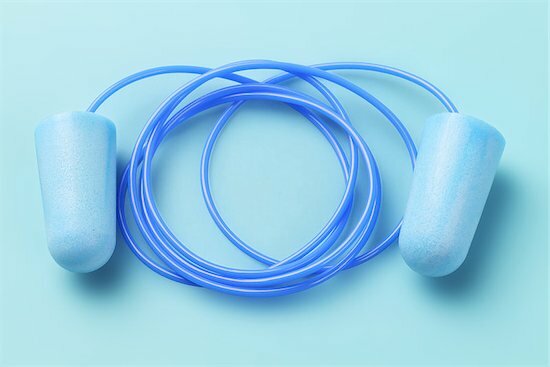 Earplugs are much more effective in providing protection from noises in the low frequency spectrum, whereas earmuffs offer better protection against noises on the high end of the spectrum. Either one will reduce the sound energy that reaches the inner ear by between 15 and 30 dB of sound, and when the two devices are used in tandem, a person wearing them can expect to have twice as much protection than by using either one alone. Anyone who suspects that they may have sustained noise-induced hearing loss should seek professional advice from a doctor who has been trained in ear and hearing disorders. This kind of doctor will be able to diagnose the specific condition affecting a person’s hearing, and can recommend the most effective kind of treatment program. Unfortunately, there is no real cure for noise-induced hearing loss, because damage to the inner ear is irreversible. There are various devices available which can help restore hearing if only one ear has been affected, and there are also amplification systems such as hearing aids, which can be used in certain situations. There’s also a great deal of very promising research being conducted by such organizations as the National Institute on Deafness and Other Communication Disorders. One of the specific areas being researched now is how using antioxidants may be able to prevent hearing loss due to noise-induced causes, and may actually be able to restore relatively normal hearing. Early results have already demonstrated that vitamin D and aspirin can reduce the effects of hearing loss when they are used prior to the event which produces excess sound energy. Other research conducted on laboratory animals has shown that exposure to loud noises does not result in hearing loss when the animals are provided with vitamins A, C, and E before being exposed to a loud noise. Hearing loss is usually considered part of aging. In other cases, medical issues may be blamed. A high percentage of the population experience issues with their hearing, and that number is increasing. However, evidence is growing that much hearing loss may actually have non-medical and, thus, preventable causes. What are some of these causes, what is truly preventable hearing loss, and what precautions can be taken that will maintain hearing health? Here are some answers to those questions. Exposure to loud noises, especially on a regular basis, is an environmental factor that can have a detrimental effect on hearing. In fact, noise-induced hearing loss, or NIHL, is one of the top non-medical causes of hearing loss. This type of hearing loss definitely goes into the category of preventable hearing loss. Often, it only requires a bit of forethought and preparation to protect oneself against hearing damage. One of the primary causes of NIHL includes workplace noise. Wearing protective hearing gear, especially when using power tools or operating heavy machinery, can limit the effect this type of environmental noise can have on your hearing. Heeding this warning will go a long way to preserving the ability to hear. It is fun to gaze and wonder at fireworks on New Year’s Eve and Independence Day, but getting too close can result in damage to fragile mechanisms within the ear. Commuting to work is another daily chore that many have to do. In an effort to make the time pass, listening to music is popular. Another category of preventable hearing loss is in not raising the volume too high. Putting in ear buds may be enjoyable, but it can harm hearing. Lowering the volume can help. Two other ways hearing can be damaged, and certainly fall into the category of preventable hearing loss, are smoking and earwax buildup. First, smoking can restrict blood vessels, making it difficult for the ear to function properly. Earwax, or cerumen, is a naturally occurring substance that is important for protecting the ear. However, too much earwax can impede hearing and should be removed properly. Like most things, hearing is often taken for granted, that is, until it is gone. It is a shame when the cause is something that fits into the category of preventable hearing loss. By taking certain precautions, hearing can be protected and it can last a lifetime.